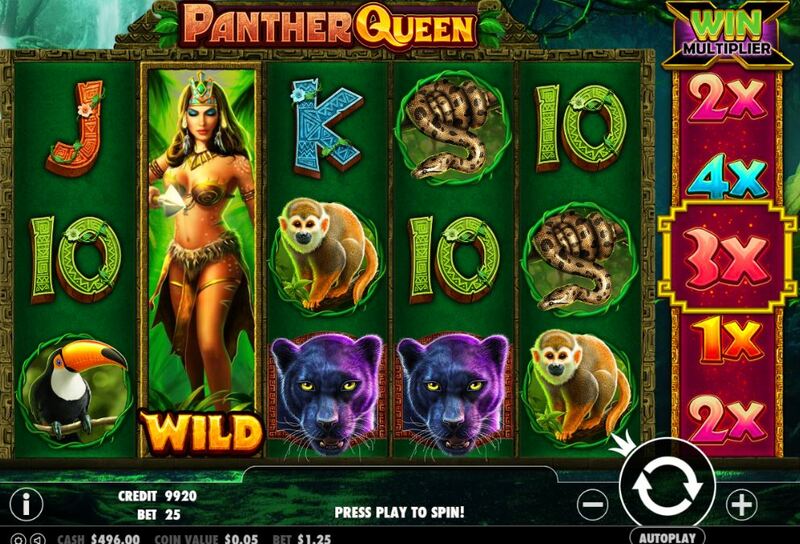 Panther Queen is another slot from dynamic casino game developer Pragmatic Play. Their games are always feature-packed and tend to be different from the rest of the pack. This time we have a jungle theme along similar lines to WMS's Amazon Queen, combine that game with IGT's Prowling Panther and you have the graphics to make this game! The tall Amazonian warrior woman and the black panther are the central characters as we traverse deep into the dark green world of Amazonia - what do we find? 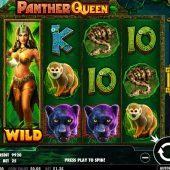 There are 25 pay lines appearing over 5 reels and 3 rows with a green jungle background in Panther Queen. You hear the various sounds of the forest's animal and insects along with a tribal drum and pipes music in the background - it's actually quite soothing, so we need to get this Panther roaring! The symbols are all single and the Panther does indeed roar with a nice 16x bet for 5-of-a-kind and we have the Monkey, Toucan, Python and Flower too with wins of 10 down to 4x stake respectively for the 5. Tribal carvings cover the remaining symbols which are the usual card icons, the lowest of which comes in at 1x bet for 5. We are missing two things thus far: the Amazon Queen and the scatters. I can explain the former; she is the game's Wild and appears on all reels singly with no multiplier and pays the same as the top-paying Panther for 5, but she has a surprise in store for us - if landing on the centre row on any reel she becomes an expanding Wild. As for the latter, well there aren't any scatters but before you become disappointed I will mention the 6th. reel which spins on the game. This has multipliers ranging from 1-10x and these apply to any win landing, thus increasing your best 5-of-a-kind to 160x stake. There is one other symbol which appears on the 6th reel, the Mayan Temple and this your free games bonus trigger. So, you've landed the Temple on the 6th reel, what happens now? Well you get 5 free games, and the 6th reel still moves with each spin so you can get unlimited retriggers too - plus the multipliers are there still. There is one great enhancement though - the centre 3 reels join and become 'Blazing Reels' inhabited by giant 3x3 block symbols, including our Amazonian Panther Queen Wild! The maximum pay can be achieved in the base game too, but in free spins it is more likely, a Wild on the centre of reels 1 and 5 plus the giant block Wild landing in view would award 400x bet multiplied by up to 10x via the 6th. reel thus you have a potential of 4000x bet win. Nice if you can get it!